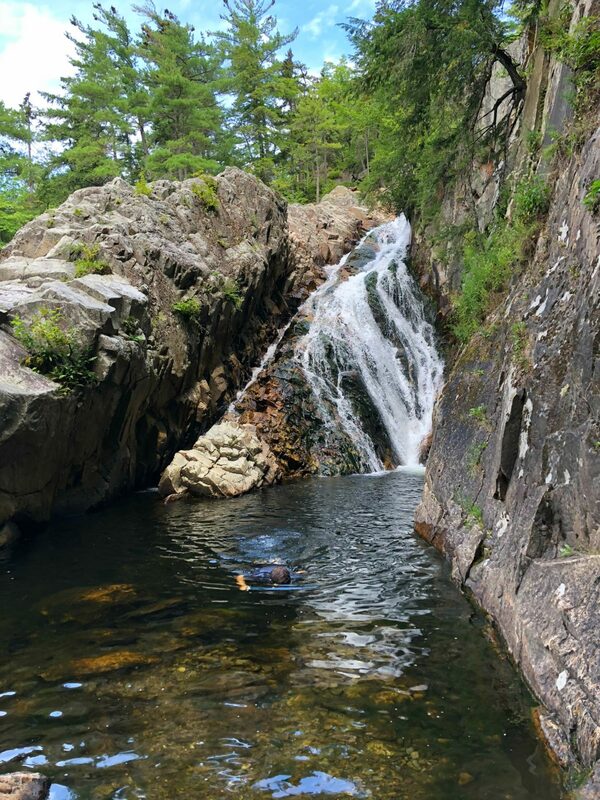 This summer we decided to check out a bunch of nice waterfalls in Vermont. 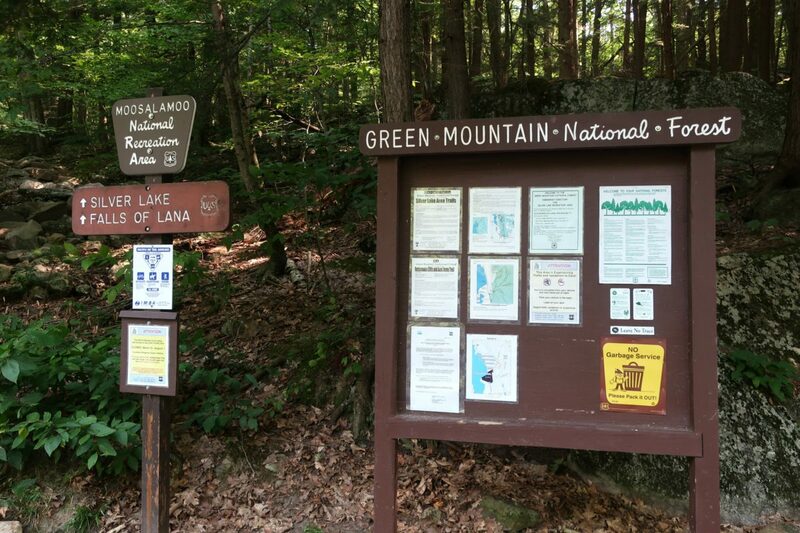 We had heard that Falls of Lana was impressive, so headed out to Salisbury, Vermont to check it out (mid-August 2018). 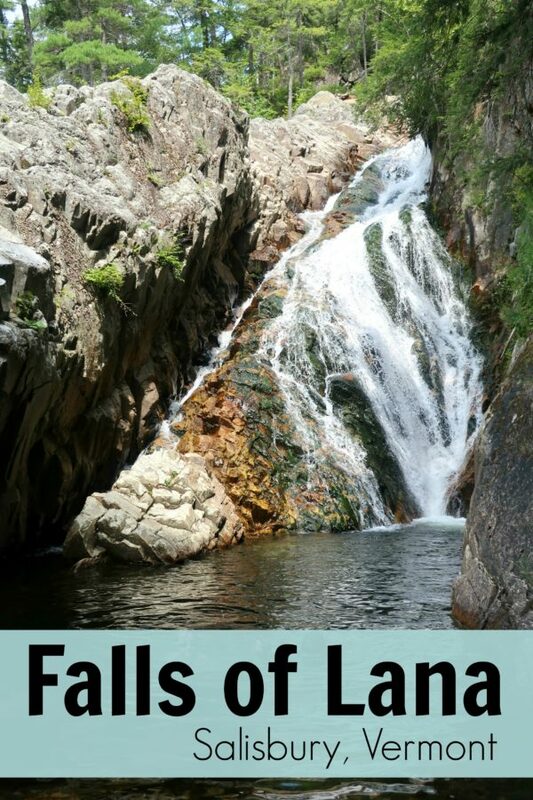 Falls of Lana is not far from Branbury State Park, and is about 40 minutes north of Rutland. 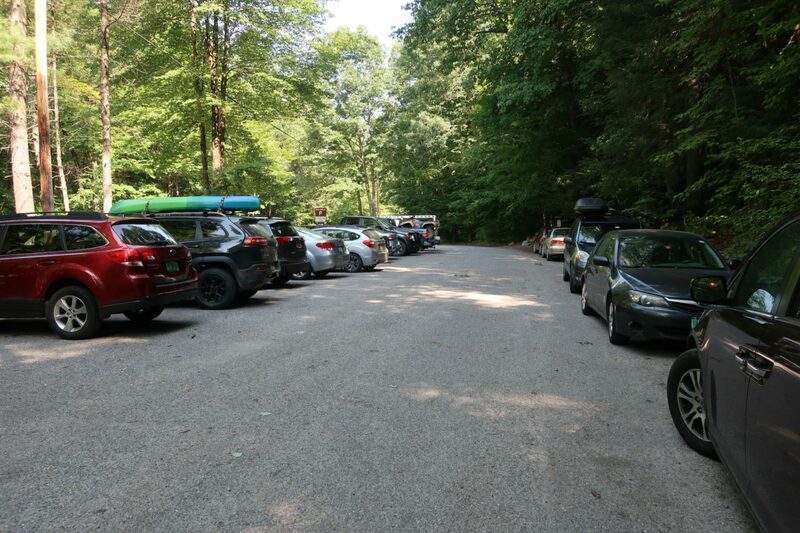 There is a large parking lot, and even so, we had to park along the edge of the lot as it was full. 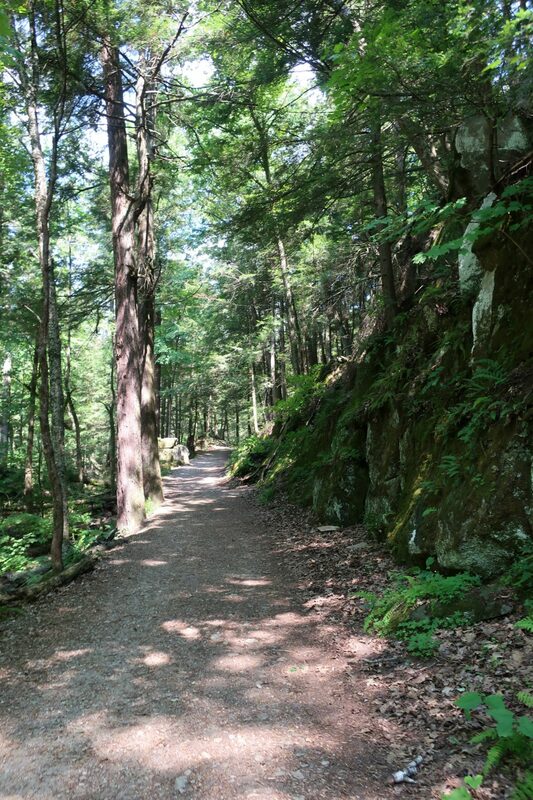 There are various trails here in the Moosalamoo Natural Recreation Area. 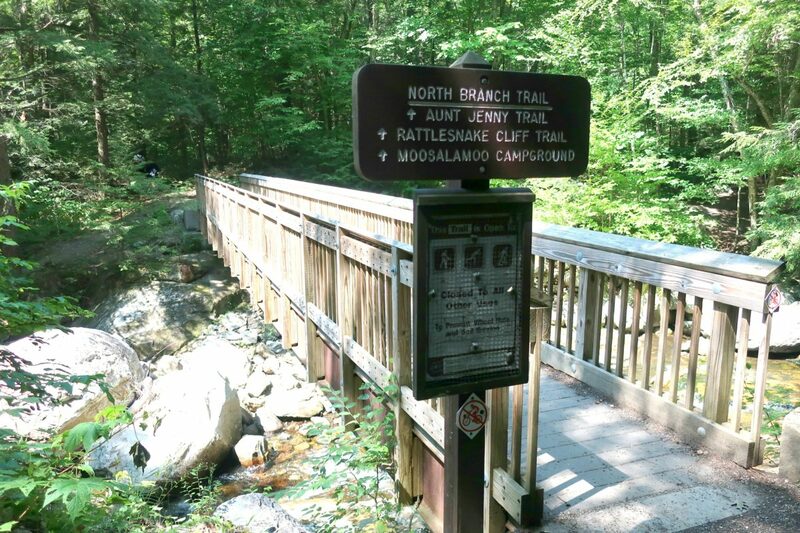 The trailhead had useful information about the area. 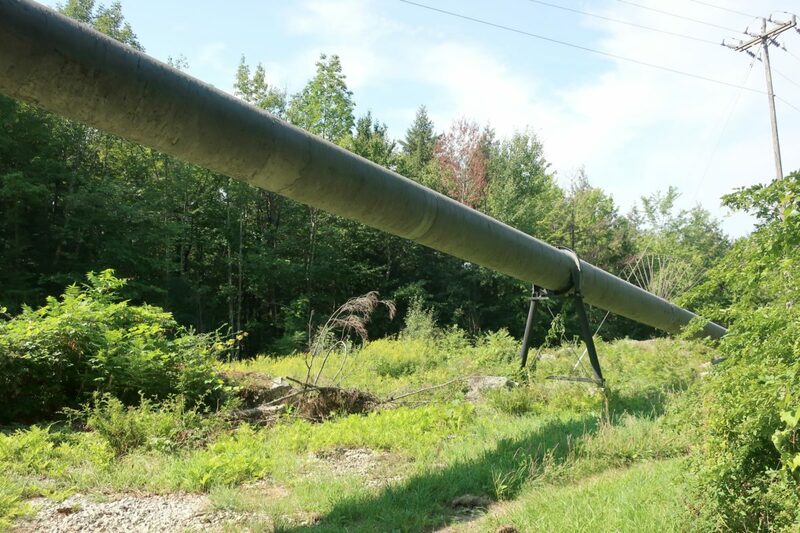 Not far along the trail is a giant pipeline. 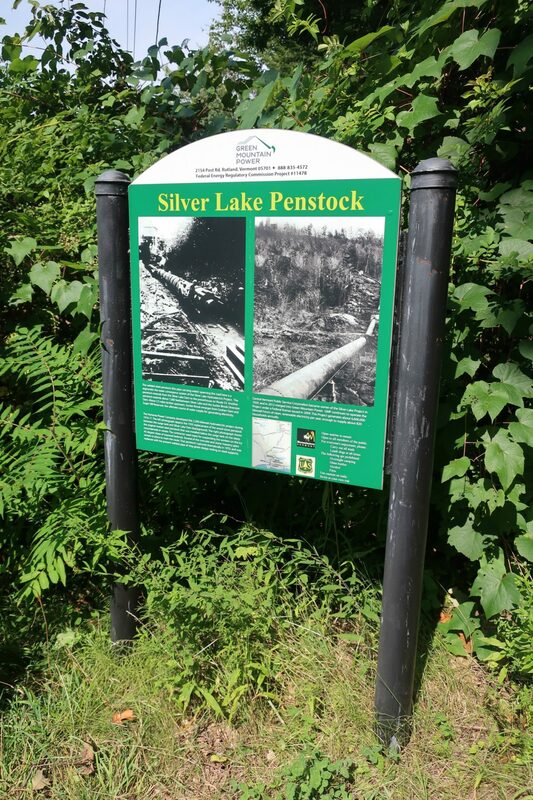 Built in 1922, the penstock feeds water from Silver Lake down to a local hydroelectric power station. Right after the penstock, we took a left to check out the first of the Falls of Lana. We reached the bottom of the trail where it meets the falls. You have to scale the rocks a little bit, but we did it carefully with our two kids (ages 8 and 11). You can see them swimming in the water! In the middle of August, water levels were low, but there was still enough water to swim in. 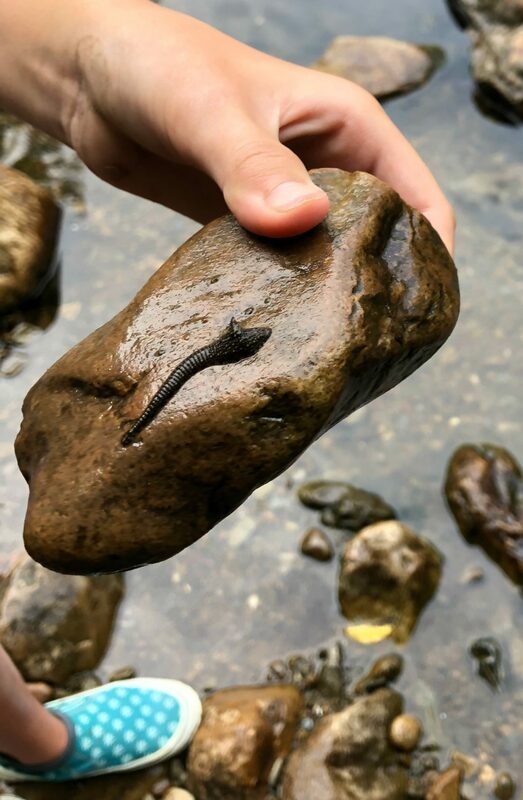 My daughter found some leeches there, too! 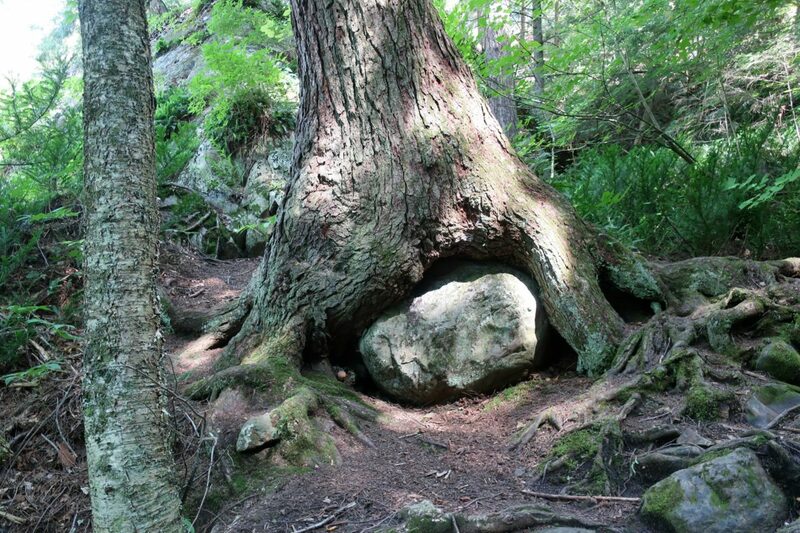 Heading back up to the trail, there was this cool old tree that had grown around a boulder. After checking out this waterfall, we headed back to the trail to walk up further along the stream. There are lots of places to swim and wade as you go upstream, and we saw people swimming in a variety of places. 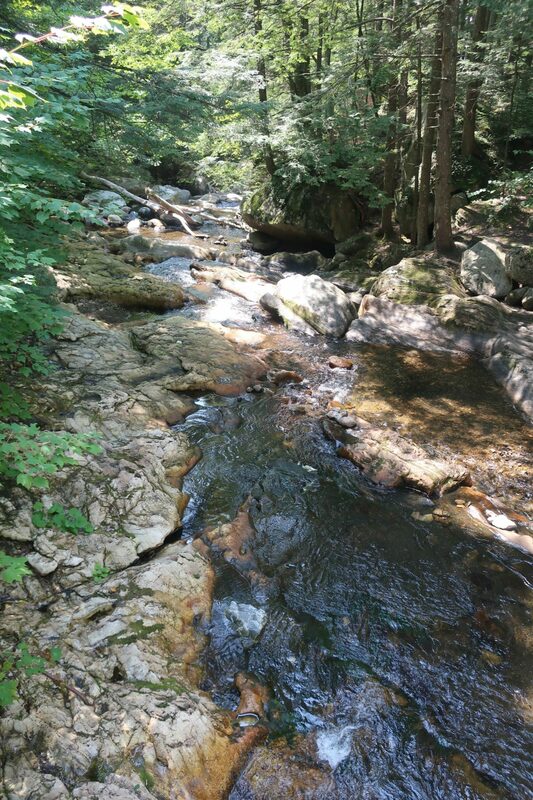 Once we reached this bridge, we stopped to take a break, wade in the stream, and then return back to the car. We had a great time at Falls of Lana. What a beautiful place to explore, and we would love to go back to explore more. Nice, i like to visit some day. Keep it up! How beautiful! We love nature and we always are looking for new waterfalls. It looks like you had a great time. Water is love to me so waterfall I find lovely. It was a very great hike. The pictures are really lovely. I grew up in Vermont and sadly have not been back since middle school. But these pictures are bringing back a flood of memories, especially as I think about the fall with the glorious leaves changing colors. how peaceful is this place! i can imagine having walks here and re-energize! Love your post. 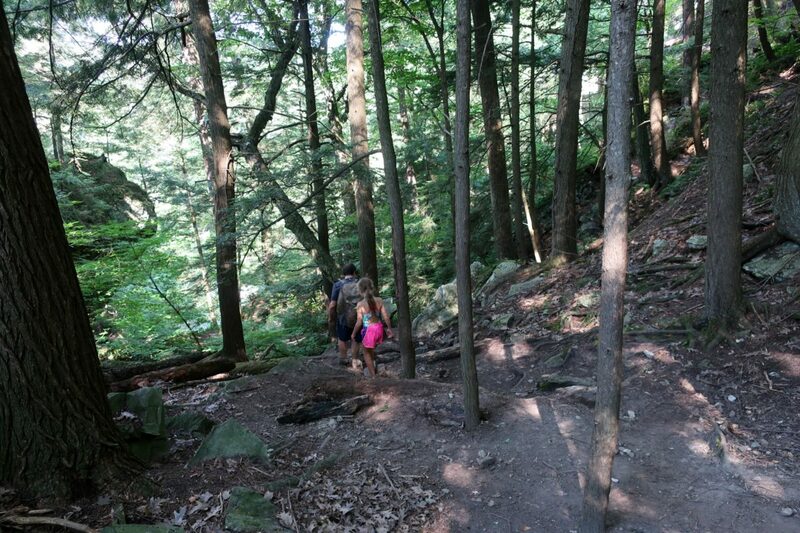 My kids love hiking and being outside. Love that he swam in the middle of the woods. Thanks for sharing. Wow! Your pictures are stunning! This looks like a great place to explore! Since moving to Arizona, I miss seeing the green. Trees that change colors on the fall. I love hiking. I need to put this on my bucket list. Never been to Vermont. Thanks for this post. Wow, this has to be one of the most beautiful places I have ever seen! I seriously think I could spend forever there! OMG! What a beautiful place, Beautiful waterfalls and beautiful natural pools. This reminds me so much of my childhood and th wonderful places my grandpa used to takes back in Venezuela. What a beautiful place! I love to be around water. This type of trips are so much fun. I’m sure you had a blast exploring nature. The scenery is so beautiful. The falls are gorgeous as well! I love nature and am amazed at all the different scenery that nature has to offer. this just makes me miss the days when I used to go out and hiking all the time. I would love to go and see the falls whenever I went out on those hikes. It is always lovely to go back to nature and regain our energy. In Japan, it is believed that visiting the nature gives a thorough cleansing of your being. I’ve never been to Vermont and have always hoped to visit there. This looks like a very scenic place. I’m a little surprised people would be swimming with leeches, but then again I’m a bit of a chicken. I absolutely dig the whole trek or trail to get to the waterfall and then relax there spending your time dipped in the water…a lovely post right there! 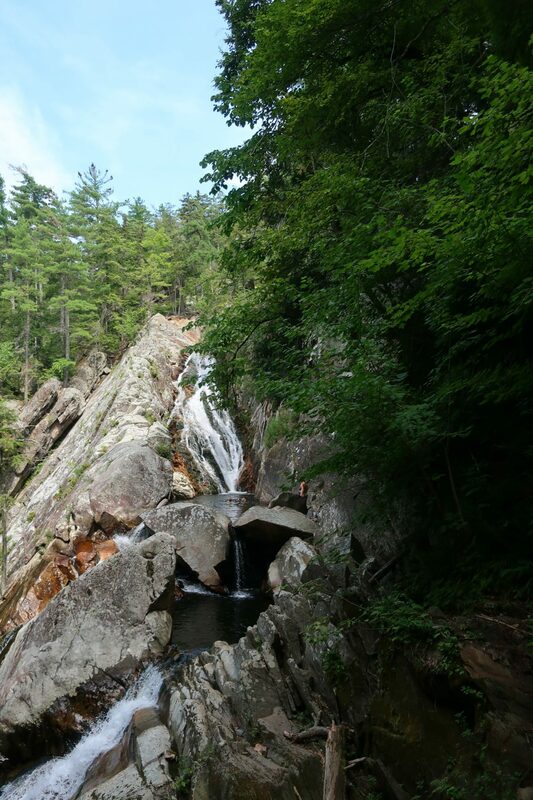 I have wonderful memories of hiking to see falls in the mountains, but we never made it to Vermont. It looks beautiful … maybe my family will make it that way some day to see this. 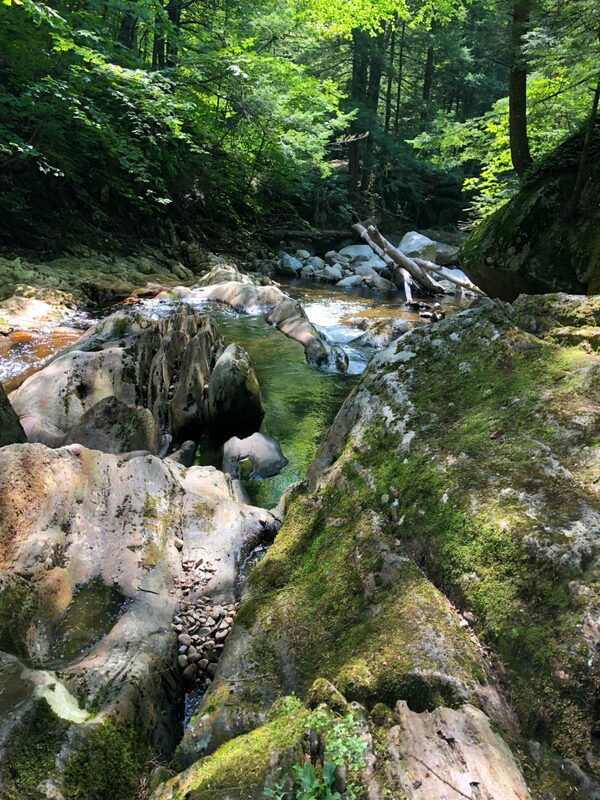 It looks like a beautiful spot, the perfect place to hike in the summer and cool off afterwards (while trying to avoid leeches of course 😉 ).